Be prepared. 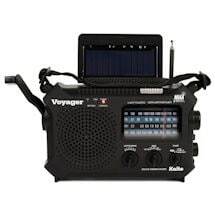 Rugged radio works with four sources of power: solar, dynamo crank, 3 AA batteries, or plug-in. USB port also lets you charge it with a PC or charge cell phones and other electronic gadgets with the crank. 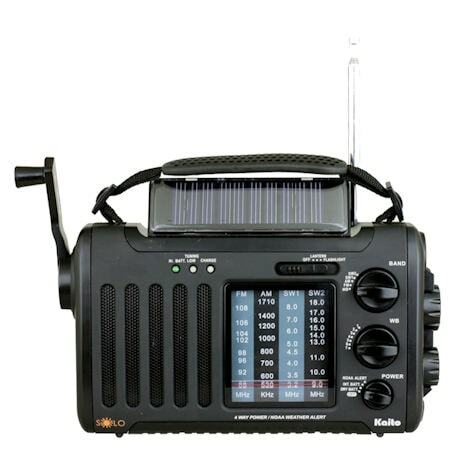 Receives AM, FM, shortwave, and 7 pre-set NOAA weather channels with alert. 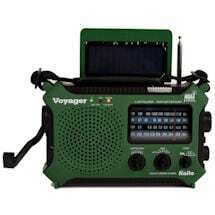 Built-in flashlight, rechargeable Ni-MH battery pack, 5-LED reading lamp, telescoping antenna, earphone jack, adapter tips, carry strap, rubberized water-resistant housing. AC Power adapter included. AA Batteries not included. 8"w x 2"d x 4¾"h; about 1½" lb. By Kaito.